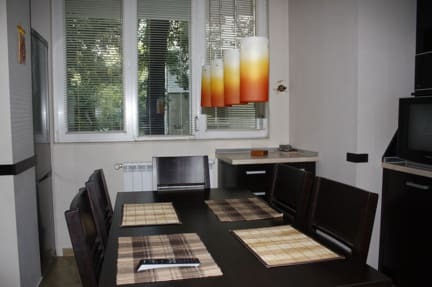 Luxury 2 bedroom apartment, living room, free hi-speed (150 Mbps) Wi-Fi internet, air-conditioner, cable TV -200 channels, DVD, CD, MP3, radio, balcony, central heating. Оne bedroom with a queen sized bed, big wardrobe, cable TV 40 inch-200 channels, tellephon, dry hair, iron and ironing board. 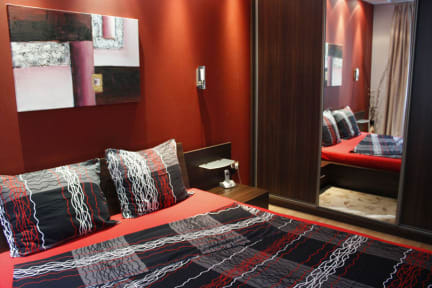 Second bedroom with two single beds, cable TV 32 inch-200 channels. Equipped kitchen with cable TV 21 inch-200 channels, cooker, fridge, microwave, coffee and tea maker, washing-machine. Two toilets, shower with tub, running hot water. Linen and towels included. Children friendly, flexible check in-out (0-24hrs) available, travelinfo, map of Sofia. Security (0-24hrs) car parking available. Near-by there are mall, car rentals, restaurants, supermarkets (0-24hrs), shops for your convenience. 10 euros/car, pick up from airport and key from the apartment. Excursions, cars/taxi/van/bus/coaces hire, transfers for groups of 1-59 passengers to and from Sofia Airport to all winter and summer resorts and hotels in Bulgaria and Europe. Location: 'Iavorov' district, block 67.